Huge flames leaped from the vessel and a dark plume of black smoke cut across sunny skies on an unusually chilly winter day in the Tampa Bay region. Authorities say all 50 passengers safely made it to the nearby shore after a rescue operation in the Tampa Bay area. A casino company said Monday it never had a problem with the shuttle boat that burst into flames off Florida’s Gulf Coast, leading to the death of a female passenger. 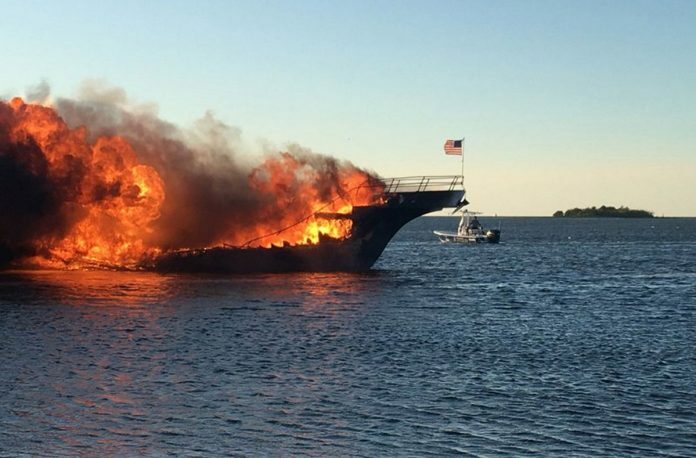 Tropical Breeze Casino spokeswoman Beth Fifer said the company does not know what caused Sunday’s huge blaze, which gutted the 12-year-old shuttle boat and forced about 50 passengers to jump into chilly waters off Port Richey. “We are deeply saddened for the loss of our passenger, the 14 injured and anyone else who was affected by this tragedy,” Fifer said. Regional Medical Center Bayonet Point spokesman Kurt Conover said Monday that the passenger arrived at the hospital’s emergency room at 10 p.m. Sunday and died shortly afterward. He said she had apparently gone home after the fire but became ill. The Tampa Bay Times reports that the Pinellas-Pasco Medical Examiner’s Office identified the woman as Carrie Dempsey, 42, of Lutz, Florida. Her cause of death has not been released. Conover said eight other passengers were treated at the hospital and released. Authorities originally said no injuries were life-threatening. Coast Guard Petty Officer 1st Class Michael De Nyse said investigators will determine the cause of the fire and examine the history of the boat and Tropical Breeze Casino. Helicopter video taken by WTSP-TV early Monday shows the boat was burned down to its hull, with only an American flag on its bow uncharred. The shuttle boat regularly carried people back and forth from the Tropical Breeze’s offshore casino, about a 45-minute ride into international waters. There, passengers would play games such as black jack, which is illegal at non-Indian casinos in Florida, and roulette, which is illegal statewide. The shuttle boat caught fire about 4 p.m. Sunday, quickly engulfing the boat close to shore near residential neighborhoods. Officials said the boat was headed out to the casino ship at the time. Port Richey Police Chief Gerard DeCanio said the shuttle boat experienced engine problems after leaving the dock at Port Richey, a suburban community about 35 miles (55 kilometers) northwest of Tampa. But as the vessel turned back, flames kicked up and people began jumping overboard into shallow water, according to witness accounts. Larry Santangelo, 57, said he had just driven into his neighborhood when he saw smoke and fire and thought a house — possibly his own — was ablaze. But then he realized it was the boat just about 100 yards (90 meters) offshore. He told the Tampa Bay Times that he then saw people wandering about confused, wet and cold, after they reached land. One woman collapsed upon reaching shore and vomited, he said. Santangelo said he took about 30 of the passengers into his garage to warm up and recover. “It was so windy and they were soaking wet,” said Santangelo. He worried that some might suffer from hypothermia. It wasn’t immediately clear what caused the fire, which sent a huge plume of dark black smoke wafting over sunny skies on an unusually chilly winter day in the Tampa Bay region. “It looked pretty dramatic because the shuttle boat burned really fast,” DeCanio told The Associated Press on Sunday. Another witness told the Tampa Bay Times the shuttle boat passes regularly by his family’s home, carrying patrons to and from a casino ship offshore. But he knew something was wrong when he saw smoke and heard shouts and screams. Jandali said passengers had to jump about 12 feet (3 meters) from the boat and wade through waist-deep water to shore. There, residents gave them aid. News footage at the site showed bedraggled survivors cloaked in blankets trying to warm themselves afterward. The boat was identified in newspaper reports as the Island Lady, a 72-foot wooden-hulled vessel which Fifer said had been inspected by the Coast Guard. Fire swiftly engulfed a shuttle boat Sunday afternoon used to ferry patrons to a casino ship off Florida’s Gulf Coast, forcing the crew and dozens of passengers to jump into chilly waters close to shore, authorities said. Fifteen people complaining of chest pain, smoke inhalation and other minor injuries were taken to the hospital to be checked, authorities said, adding no injuries were life-threatening after the huge fire consumed the boat close to a residential neighborhood. Port Richey Chief of Police Gerard DeCanio said all 50 passengers and the crew reached land safely as the fast-spreading flames devoured the shuttle boat. Huge flames leaped from the vessel and a dark plume of black smoke cut across sunny skies on an unusually chilly winter day in the Tampa Bay region. “It looked pretty dramatic because the shuttle boat burned really fast,” DeCanio told The Associated Press by phone. DeCanio said the shuttle boat was close to shore when it began having engine problems after leaving its moorings at Port Richey, a suburban community about 35 miles (55 kilometers) northwest of Tampa. He said the crew decided to turn back veering close to a residential neighborhood as smoke belched and then flames kicked up. A witness told the Tampa Bay Times the shuttle boat passes regularly passes by his family’s home, carrying patrons to and from a casino ship offshore. But this time, he said he saw the clouds smoke billowing from the shuttle vessel and heard shouts and screams. Jandali said passengers had to jump down about 12 feet (3 meters) into chilly and somewhat shallow water. He said those escaping had to wade through waist-deep water to land. Local residents there offered them towels, socks and water to drink. The shuttle boat regularly carries people back and forth from the Tropical Breeze Casino Cruise, which is offshore because it can’t legally operate close to land, according to authorities. They said the shuttle vessel was headed out to the casino ship at the time of the fire. Tropical Breeze Casino Cruises didn’t immediately respond late Sunday to calls for information. Pasco County Fire Rescue official Shawn Whited said that after passengers jumped into the water they made their own way or where plucked up by other boats. Local television news footage at the site showed survivors cloaked in blankets trying to warm themselves after their ordeal. Larry Santangelo, 57, said he had just driven into his neighborhood Sunday afternoon when he saw smoke and fire. He told the Tampa Bay Times that he then saw people wandering about confused, wet and cold. One woman collapsed on reaching shore and vomited, he said, adding he took about 30 of the passengers into his garage to warm them up. “It was so windy and they were soaking wet,” said Santangelo, adding he worried some would suffer from hypothermia. It wasn’t immediately clear what caused the fire. Authorities said the Coast Guard, sheriff’s office, police and other agencies took part in rescue operations. The Sun Cruz Casino Boat Engulfed by Flames, Dozens Safely Escape off Florida’s Gulf Coast in the Tampa Bay region. Fifteen people complaining of chest pain, smoke inhalation and other minor injuries were taken to a hospital.